Panoramic photography is nothing new, as photographer’s have been producing panoramic images for many years with DSLR’s and tripods, but a new concept called the Panoramic Ball camera by Panono is about to make things a whole lot easier and a lot more fun. The Panoramic ball camera is a unique idea in the digital camera market, it’s a sphere with 36 different 3MP sensors built into its surface, along with an accelerometer, processor and on-board memory nestled within. You throw it up into the air and when it gets to its highest point it takes a photo with all 36 sensors instantaneously. The in-built software then stitches a low-resolution version of the panoramic together and sends it over to the app on your phone via either WiFi or bluetooth. To stitch together the high-resolution version, the ball camera sends the information to Panono’s cloud servers via your phones 3G/4G or WiFi connection. When it’s finished the final version is sent back to your phone via the Panono app. To view the finished 360° photo on your tablet or phone, you just move your tablet around and the image follows your movements allowing a full 360° preview. You can also access the original 36 images that the Panoramic Ball camera took initially. (check out the video below for a demonstration). In addition to just throwing the Ball Camera into the air by hand, you can also use a tripod to mount it or buy a handheld pole and trigger the camera remotely, plus a shutter button is located on the top of the ball to allow for manual activation. The whole unit is also toughened so if it hits the floor you won’t break any sensors. 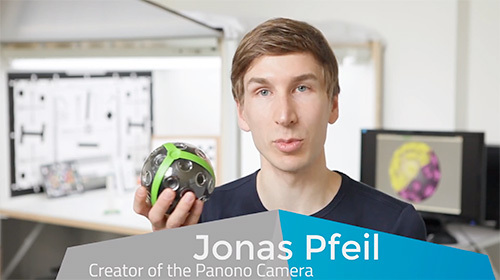 The brains behind the panoramic ball camera is Jonas Pfeil, who came up with the idea during a holiday with friends in Tonga. He was using a DSLR to capture panoramic images of the South Sea Islands but kept having to stop for long periods waiting for his DSLR to process the images during his panoramic sweeps. His friends were getting a little impatient at Jonas slowing their sightseeing progress he made a mental note to see what he could do to speed up the process . After his trip he dreamed up the idea for the throwable ball camera and wrote a thesis based on the idea whilst studying at the Technical University of Berlin. In 2011, he built the first prototype and after receiving positive feedback from peers and tech journalists, he formed a company called Panono to take the concept further launching a successful crowdfunding-campaign on Indiegogo raising over $1.25 million. One area where most panoramic apps for smartphones tend to fall down is the stitching together of images with the misaligning of edges or ghosting of moving background subjects resulting in people with limbs missing or vehicles cut in half. The Panoramic Ball Camera manages overcome this problem because of the sensors taking the images simultaneously, with no time-delay that you normally encounter by having to move your camera around slowly in a full circle. The in-built software also does a fine job of aligning images, which anyone who tried producing panoramic images in Photoshop will attest, its not always easy, with perspectives not quite aligning and background elements moving between shots. Overall, this seems like a great bit of kit for the avid photographer, providing a easy way to get a great panoramic. It will be interesting to see what people come up with after this hits the market. 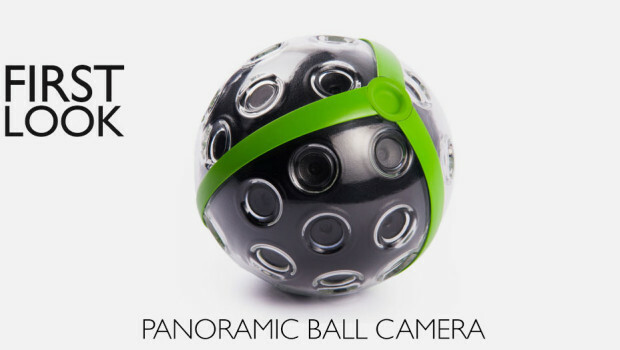 The Ball Camera is currently available to pre-order from Panono retailing at €549 plus shipping.